My entire life has been spent in the sugarwoods, one way or another. 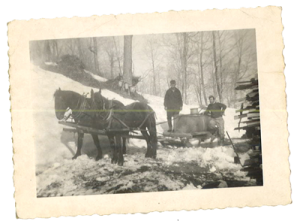 As a child, riding always on the gathering sled or trailer, hanging on for dear life, mittens soaked with sap slopping up out of the filter, and hours in the sugarhouse while Dad boiled. 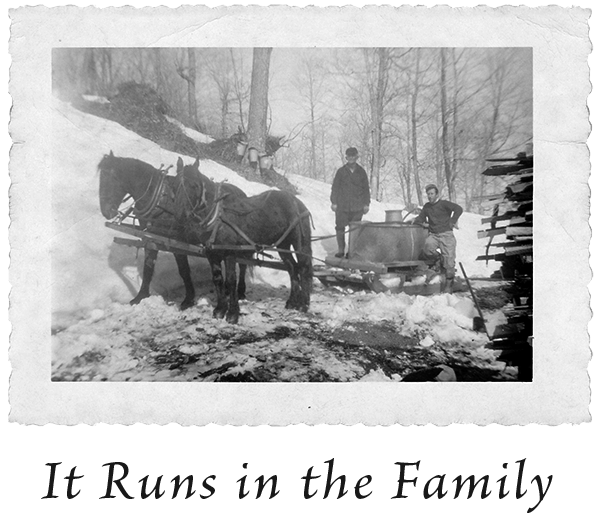 He gave us tastes of hot, fresh syrup, we always had a big cardboard box of food, and filling the wood pallet from the woodshed was a constant job. The sugarhouse roof held great appeal, and we lay up there, we our heads over the open flaps in the cupola, wishing we could bottle that sweet steam and breathe it in all year ’round. Dad would swing open the big door of the arch, where the fire roared, and let us cook hotdogs on wires or sticks. And marshmallows. The boiling went on late into the night, and there was always an old couch with a pile of oats to nap in. Dad loved to tell visitors all about the process, and give out samples. Often he would save some sap ’til the next day, special timing for busloads of schoolchildren to see. I grew and gained the job of driving the bulldozer through the sugarwoods, learning to anticipate just where to stop for each man gathering the sap to pour it into the tank. “Whoa!” was frequently yelled to me. There was some impatience when I drove off the road. It was sometimes hard for a girl to see just where to go, if there was fresh snow. My brother David would take over, backing up and using the blade to push the rig out. The sapsled would jackknife, and there would be some time lost, but he always righted things, and on I’d climb again to drive on. The trip from the home farm woods to the sugarhouse was taken at top speed, often with Stuart driving and singing “Casey Jones” at the top of his lungs. The snow sprayed up from the tracks, and I was on top of the world, a team with my brothers and Dad. At the end of each season came the bucket washing, with Dad holding each one onto a set of revolving brushes in a tub full of sudsy hot water, and me rinsing in another tub. David hauled them to a nearby garage, to stack in pyramids clear to the ceiling, to dry. Mom put the spouts through a lye water boiling, and then spread them on cookie sheets to dry in our woodstove oven. 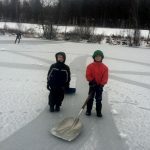 We changed over to tubing in the seventies, and Dad spent the winter making drops (the short section of tubing with a spout on one end) and tying them into bundles of twenty-five. He was comfortable in front of the fireplace. The snow was deep that year, and we trod through the woods with coils of tubing, running from tree to tree. Just like the men now, he had studied all the newest methods and equipment, and took on a whole new way of “gathering”. We had tremendous trouble with squirrels chewing the tubing, and the men spent some time in the woods shooting. They even ran an ad for someone to hunt them! The UVM Extension newsletter advised trapping them and letting them go elsewhere. We had a great laugh over that, thinking of our sugarmaker neighbors. 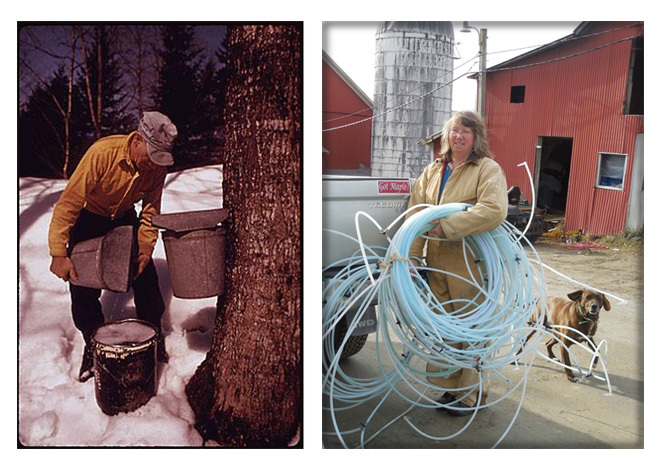 Though I hated the change from our traditional buckets and a lifetime of gathering sap with the family, I will say, I do appreciate the complicated and impressive systems of tubing that the men set up, and have come to love “walking the lines”, looking them over. Wool socks. Boot liners. Snowpants.  Turtleneck, sweater, coat, neckwarmer, hat, glove for left hand. Thermos, wire ties, nipper, wire twister, spare glove for left hand, all in back pack. Off to woods. Each time I refill my coat pocket with wire ties, I drink, and rap a hardboiled egg against a tree to crack the shell. Sidestep, twist on a tie, sidestep. Put hand on dog’s head to thank him for keeping me company. So silent and beautiful deep in the woods. Trudge along, whistle or sing for awhile. This is work? Everyone should be so blessed.